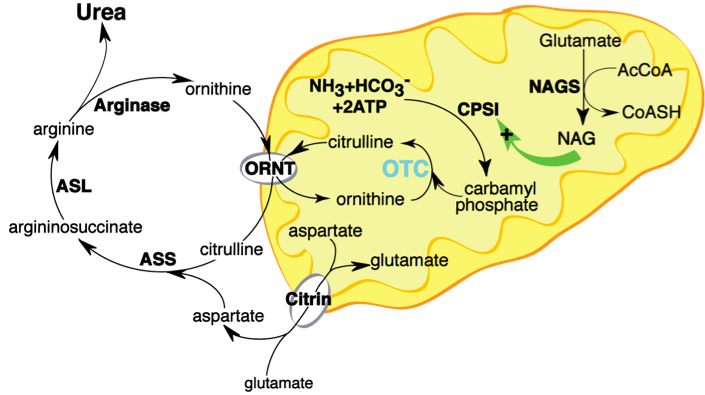 Ornithine transcarbamylase (OTC) is an enzyme of the urea cycle. The urea cycle functions primarily in the liver, and is a metabolic pathway that detoxifies ammonia by converting it into urea. Ammonia is generated from the conversion of proteins and nucleic acids in our diet as well as due to normal cellular turnover. Defects of the urea cycle result in hyperammonemia which can progress to brain edema and result in cognitive impairment or death. Ornithine transcarbamylase deficiency is an inborn error of metabolism usually caused by mutations in the OTC gene. Ornithine transcarbamylase deficiency affects approximately 1:16000 children, and accounts for nearly half of all inherited urea cycle disorders. Shown below is a schematic of a cell with the various enzymes of the urea cycle highlighted.